Mazi Nnamdi Kanu, the leader of the Indigenous People of Biafra (IPOB), has reportedly sponsored a football competition in detention. According to Vanguard, Kanu, who is in detention over treasonable felony alongside two others, is the sponsor of the 2016 Kuje Prisons Football Championship in Abuja. Sources disclosed that Kanu, while declaring the competition open on Friday, July 29, informed that the main essence of having the tournament was to help inmates have freedom and relate freely with one another. Kanu has also spoken from his prison custody on Monday, July 25, claiming that it was not his choice to stir the agitation for Biafra, but a call made by God. The detained leader of the IPOB insisted that his decision to restore the nation of Biafra was not his personal choice but a mandate from the Most High God (Chiukwu-okike-abiama) which was assigned to him from time immemorial. 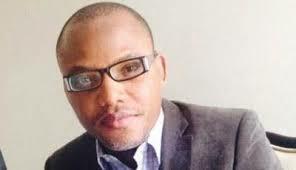 Kanu maintained that the restoration of the nation of Biafra is a priority and a project that must be achieved under the watchful eyes of the IPOB led by himself, an arduous task that must be accomplished in order to lead his people out of the contraption called Nigeria, without fear of death.